Xiom MUV 4.0 Allround Plus Premade Shakehand Racket - Power, Performance, Precision. Equipment makes a big difference in today’s table tennis game. The MUV Series is designed for lifestyle players who wish to enjoy the real excitement of table tennis at the highest level and at an affordable price. MUV Racquets are designed to perform. With MUV, the Wood, sponge, rubber are harmonized to produce an outstanding balance of spin, speed and control. Rubber and Sponge: Table Tennis is a sport of Spin and the quality rubber top sheet and sponge are critical to effective table tennis play. Each MUV racquet possesses a high friction rubber top-sheet with enhanced elasticity in the sponge undercoat. The result is a ball friendly rubber surface that can produce winning shots. 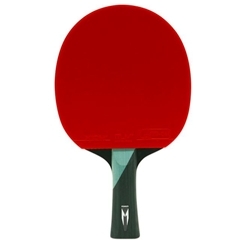 Wood Blade: Blade weight, increases power and ball speed, but added blade weight results in reduced control and flexibility in the all-important close to the table play. The wood used in the MUV blades maximizes ball speed and power with minimal increase in weight. Manufacturer Specifications – MUV 4.0S Shakehand Table Tennis Power. Approval: International Table Tennis Approved. Sponge: Z Power Sponge with pro tension. Wood: Superlite 5 Ply – power wood. Handle: Ergo comfort flare grip. Available in Blue, Grey, Yellow and Orange. Video: For additional details please view our in-house video.